The plan was to escape the snow for once, except this was the winter without any. Regardless, it didn’t discourage me from taking a trip south in February to do a little hiking around the red rock country in Arizona. Even there at higher elevations we walked in snow, but in Sedona apple blossoms were blooming. And down in Phoenix spring was well underway, a perfect time to explore the Desert Botanical Garden under a dazzling blue sky. 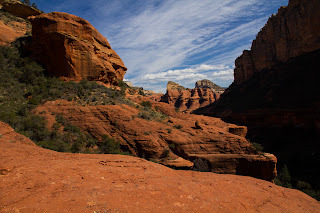 I couldn’t possibly miss the opportunity to see this extraordinary garden filled with rare and unique plants of the Sonoran desert that covers much of the South West United States and parts of Mexico. The Desert Botanical Garden was first conceived by local people back in the nineteen thirties who saw the need to preserve their native flora. 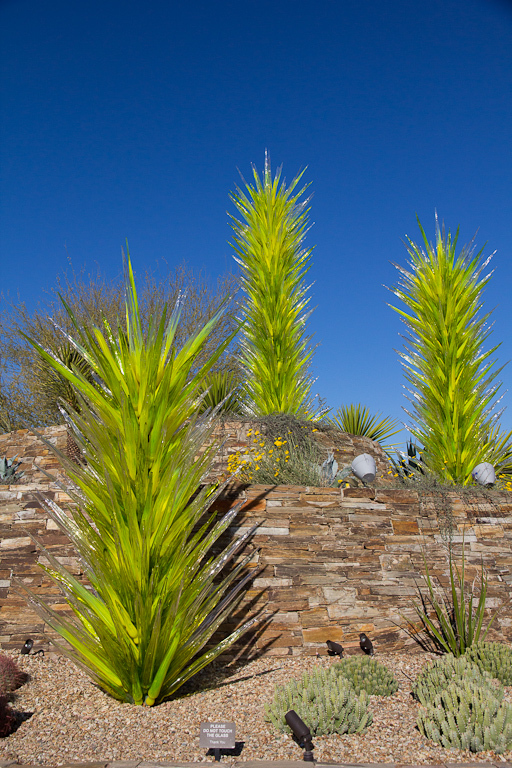 The garden has grown to 58 hectares with more than 26 under cultivation containing fifty thousand plants: yuccas with flowers on four meter stalks; huge, spiky agaves; desert wildflowers; and of course, cacti in all shapes and sizes, including a bonus — at the main entrance stands a group of priceless ones created in glass by renowned sculptor, Dale Chilhuly. Volunteers started the garden and it is volunteers who keep it humming along, all eleven hundred of them. I met a number stationed along the trails as interpreters, happy to talk to visitors about the plants in their care. 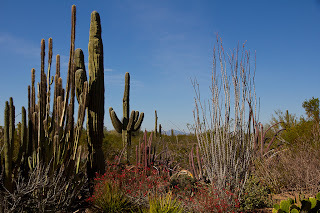 One section named the Plants and People of the Sonoran Desert contains the plants that were used to house, clothe and sustain the desert dwellers of the past. Another is reserved as an outdoor classroom where cottonwood trees shade groups of schoolchildren who gather to study the plants and, with luck, grow up to be tree huggers, except hugging is not a good idea in this garden. Getting around is easy on wide, paved trails — essential, as wandering off piste is neither permitted nor advisable where the majority of plants are assertive cacti, especially the huge, ubiquitous saguaro. 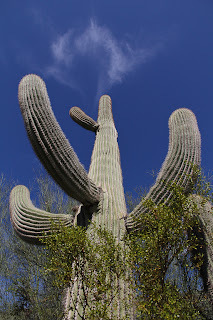 This is the cactus of countless old westerns, the original cartoon cactus, growing as tall as fifteen meters with multiple arms reaching for the sky. Sue, one of the volunteers, was on hand to explain how the arms sprout forth to increase production of the night blooming flowers that appear in April. These are followed by ruby-coloured, edible fruit in June. I also learned that when birds nest in holes pecked into the side of the Saguaro, the plant then cooperates by forming a smooth callus to line the hole, making a perfect nesting box. What did surprise me was the sight of a dead Saguaro. Somehow I thought it would simply turn mushy and rot away, but not so. Instead, it resembled a bundle of split cedar rails. 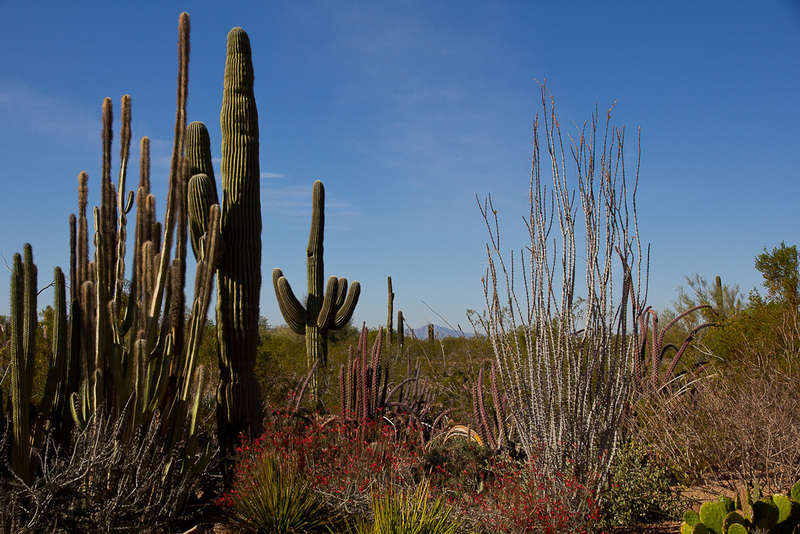 The trees and shrubs of the Sonoran are designed to retain water and reduce transpiration from their leaves. The cottonwood tree there has two sets of roots — one close to the surface that spread beyond the drip line and another that drives deep into the earth to reach the water table. The creosote shrub (Larrea tridentata) is another plant with a strong will to survive harsh conditions. It has no connection with the common wood preservative, but it does have many uses, particularly medicinal, though like many herbs, dangerous if used unwisely. It really isn’t a friendly bush. To conserve moisture, it inhibits the growth of other plants in the area, while its small, resinous leaves wouldn’t spare a hint of moisture for the thirstiest coyote. When it does rain, however, the leaves fill the air with a pungent odour, considered unpleasant by some. Volunteer Janet showed me how to sample the fragrance by simply breathing on the leaves then taking a sniff — conclusion: more a deodoriser than a designer air freshener. As usual, there were too many plants and too little time, but I thoroughly enjoyed my visit and highly recommend it for anyone passing through the Phoenix area, and it almost never snows in the Desert Botanical Garden.